Experiencing the tension of feeling like a foreigner in a land that is also somehow familiar, the Ciociaria region of central Italy provided an ideal landscape for the photographic wandering of Douglas Stockdale. Exploring the region over the course of nearly two years, his book Ciociaria published by Punctum Press presents a view of the Italian landscape that is often unseen. The images, selected by Marco Delogu, show a personal view of the region, a record of Stockdale's self-guided tour. 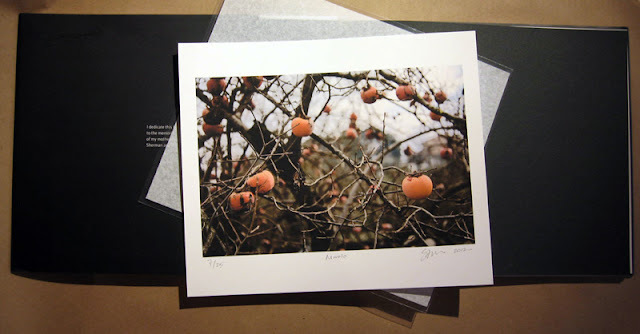 The limited editions of the book are simply packaged with one of two prints tucked in between the front cover and endpaper, held in an archival bag. Each limited edition is signed and number, with a little note by Stockdale denoting which edition the book is from. These touches further communicate the personal nature of the work. Stockdale was kind enough to share with us a bit more on making the work and the limited editions. "The color photographs in Ciociaria were made during my exploration of the country’s central region, an area that recalled my home in Southern California but left me feeling like a displaced soul. Visiting it frequently for a year and half, I slowly investigated a region that has neither a defined border nor a known history. This was a transitional period for me in which individuals began to populate the edges of my urban landscapes, avoiding a coldly objective topographic analysis while not developing a photo-documentary narrative. "After a series of design discussion with Susan Burnstine, I decided to keep the two limited editions of Ciociaria very simple much as the region of Ciociaria has maintained a straight forward approach to life. The signed and numbered print is neatly tucked into the front cover of the book. This also allowed me to keep my costs low and provide affordable editions for my first published book.